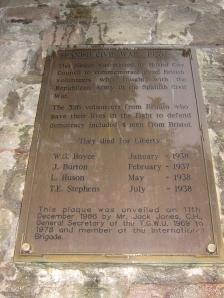 The memorial to the four Bristol volunteers who joined the International Brigades to fight fascism in the Spanish Civil War in Castle Park is to be surrounded by a vivid mosiac border in Republican colours and will be unveiled at 12 noon on 14th April – the anniversary of the day the Republic was declared in 1931. Leslie Huson May 1938 Pneumonia, died in hospital. Terence Edward Stephens July 1938 Died in hospital from blood poisoning. Close-up of the Bristol Memorial here.